This year Everyday Scholé is taking an in-depth, practical look at the eight essential principles of classical education. 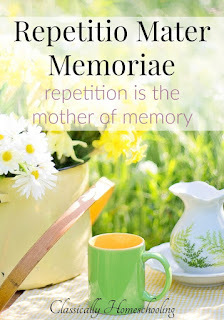 This month we are focusing on repetitio mater memoriae or repetition is the mother of memory. You can also check out previous posts in this series: Charlotte Mason and Classical Combined, Slow and Steady in Your Homeschool, Multum Non Multa Exhibited in a Charlotte Mason Homeschool. Memorization has become a bad word in most education circles today and even among most adults. Why memorize anything when you have your very own portable computer in your pocket or purse that can find out anything you need to know with a quick question? Probably the reason for the backlash is that memorization is usually not fun and it’s difficult (more so for some of us than for others! ), but if our goal as homeschoolers is for our children to really remember what they are being taught, then we must employ some strategies that will lead to memorization. This month, we’re focusing on one of those strategies, repetition. Next month, we’ll look at songs, chants, and jingles. 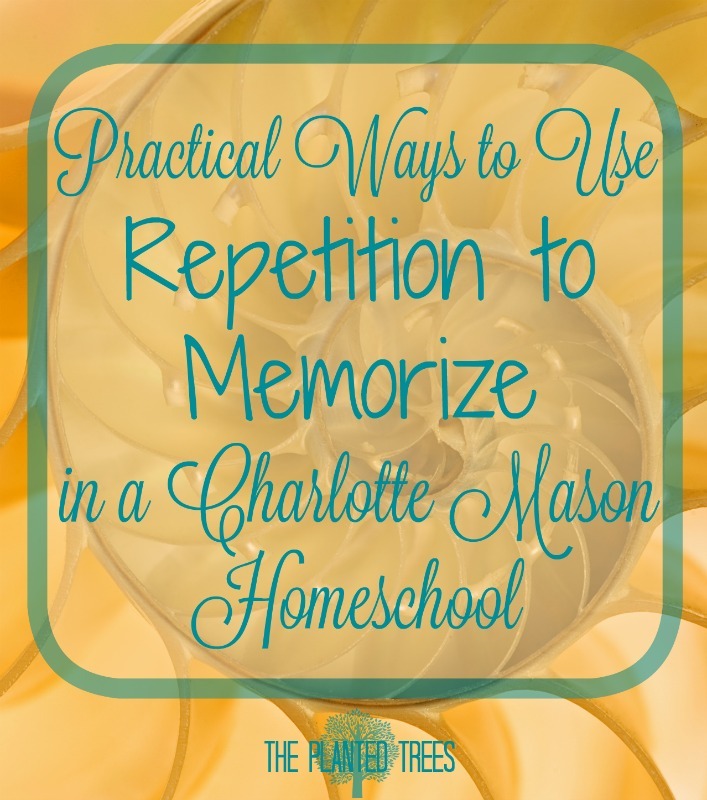 While I don’t consider this list to be the be all and end all of ideas of using repetition in your homeschool to reinforce learning, I did want to give some practical ways that I use repetition with my kids to keep information from being forgotten almost as quickly as it was learned. Charlotte Mason had children memorizing loads of information in her schools even for children that were her youngest students. 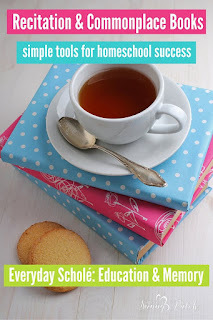 While most of the ideas I’m sharing today are easy to use with any homeschool method, some are very much a CM way to store things of most importance in your long term memory. Why Does Repetition Work and Why Will It Fail? Before we get started with practical let’s dip our toes quickly in some theory. We need to know why we are using repetition to lead to memorization in the first place. The more things are repeated the easier it is to remember. At some point I can repeat a set of numbers to you, like the first 10 digits of pi, enough times that you can eventually recite them along with me. At its most basic form, that is why repetition leads to memorization. Most people understand this, but the problem lies in two arenas: rote memorization and too much to memorize. Rote memorization is what most of us think about where an elementary aged child can stand up in front of the class and recite the presidents or the times tables from memory. It’s impressive for sure, but drilling your children until they can accomplish this feat is probably not going to be enjoyable for either one of you. However, there are ways to repeat what you’ve learned without drill, so don’t let the idea of repetition or memorization scare you off just yet. The other sure fire way to make sure repetition will fail to lead to memorization is if you have too much curriculum that is spread too broadly. I discussed this in my last post about multum non multa. When we are teaching our children a vast amount of information, instead of fewer subjects more deeply, it becomes very difficult, very quickly to keep up with the amount of information you want your children to memorize. Whenever I’m planning our studies for the year, especially history and science, I choose the facts, ideas, and concepts I want my children to remember from our studies. Those are the things I will repeat and focus on with our notebooking and activities. The amount I expect from each child varies depending upon age, but having a plan helps keep me on track and it helps me feel that we haven’t wasted a year of study when I can ask them what they learned in science that year and they can tell me. Don’t spread your too studies too thin or too much ground will be covered to make repetition and memorization nearly impossible. 1. Create associations between different disciplines. Like we talked about last time, all knowledge is one big interconnected web so use that to your advantage when you want your children to memorize. Instead of repeating facts about Paul Revere, show them the portrait of Revere painted by John Singleton Copley. Explain that having his portrait painted meant Revere was an important man in Boston and holding a silver teapot with tools lying in front of him reminds us of his profession as a silversmith. Also it’s a good way to have children remember Revere’s participation in the Boston Tea Party. You just succeeding in repeating information that you wish your children to know about Revere without drilling it, but associating his life through art. 2. Use visual and artistic methods. We studied Latin together this year for the first time and one of the things I had my girls do was create Latin vocabulary notebooks. Instead of merely copying the words and their definition, I had each girl illustrate the word’s definition in their notebook. For poēta, Sophia drew a picture of William Blake sitting at a desk with a feather quill thinking, “Tyger, Tyger, burning bright,” which was a poem we were memorizing at the time. She brought in her own associations across disciplines in that assignment! When we were memorizing a passage from A Midsummer Night’s Dream some of the lines referenced different flowers growing on a river bank. I found pictures of the different flowers online and printed them out so when the girls were trying to memorize the passage, they could touch the picture of the flower they were talking about. 3. Play games. There are lots of educational games on the market and we own quite a few. They are wonderful to use as a fun way to review. One of our favorites is Timeline which all my kids like to play. It really helps with learning the order of events in world history and it’s a quick game. There are lots of online games the kids enjoy to help review information: Prodigy for math concepts, Reflex Math for math fact review, and Sheppard Software to review almost everything, but especially geography. However, we also make a lot of games. Grace made a version of Clue that was all about mythology. The rooms were various places mentioned in Greek mythology, the characters were different Greek gods and heroes, and the weapons were taken from Greek myths as well like a lightning bolt and Medusa’s head. We also made a board game to review Spanish vocabulary a couple of years ago out of a cereal box. Depending on the space you landed on, you would translate a word or sentence from English to Spanish or from Spanish into English. It was super fun and the kids never realized it was repetition leading to memory. 4. Look for built in review in your curriculum. Once I started thinking about it, I realized that almost all of the curriculum we use has review built into it. The spelling curriculum I use for my oldest, Apples and Pears, is constantly going back and reviewing words and spelling patterns. I use a studied dictation approach for Sophia like Charlotte Mason espoused using the vintage spelling book, Modern Speller. The book is set up to constantly review words that have previously been studied as well. Even our mastery based math books have review built into them as well because previous skills are touched on again and again in subsequent chapters. The phonics program I used with Sophia, Logic of English, is awesome at built in review using games and speed drills to remember phonograms so that learning them is pretty much painless. Let curriculum work for you in this area! 5. Point out practical applications. Grace is finishing up Math U See Epsilon this summer and as we’ve worked through the book, which is all about fractions, I’ve explained to her how useful it is to know how to manipulate fractions when it comes to cooking (something she loves to do), so for part of her “school” time, I would bring her a recipe and ask her to double it, halve it, third it, etc. By having her do this, I’m not only answering her question of “why do I have to learn this?” but I’m using repetition to make sure she remembers the steps to multiply, divide, add, and subtract fractions. 6. Let them be the teacher. One of the best ways to learn something is to have to teach it. Every evening, I try to let the kids tell their father one thing they learned about during school that day or demonstrate something they’ve mastered. Sometimes I give them a heads up ahead of time so they can really give a thorough presentation. For example, Grace recently learned about photosynthesis so I told her that I’d like for her to use her diagram she drew of the process and explain it at dinner that night. Come to find out, she didn’t understand it as well as she thought since she had to reference some books to make sure she said things correctly. She had to use repetition of what we’d already learned to memorize the process of photosynthesis. 7. Implement a Charlotte Mason style assessment week. In most CM schools at the end of the quarter or semester, there would be one week set aside for assessments of what the children had learned. I’m not talking about standardized tests or tests at all, but a time to present the body of knowledge they had learned. I’ve never actually scheduled these assessment weeks into our school year, although I might give it a whirl this year, but I think using some out of the box assessments that week would be a really fun way to see how much we’ve all learned. One spontaneous assessment that happened this year is I asked Grace to tell me all she knew about Hammurabi who we’d been studying for history. She decided this was the perfect time to throw a costume together, give me a list of questions to be the reporter, and have an interview with the ancient Babylonian king himself. I still think back on that and what a fun way to do a “test” for history. Assessing how much your children have learned doesn’t necessarily mean filling in bubbles or a pop quiz, it could be a great way to add in some repetition of what they’ve been learning. 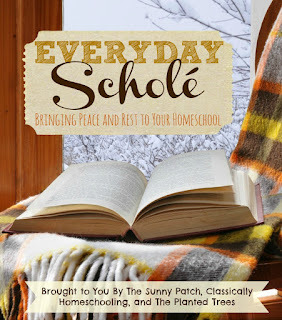 Interested to see what the other Everyday Scholé ladies think about using repetition in your homeschool? Click on the pictures below to find out. I promise you that it will be good stuff! What practical, fun ways do you use repetition in your homeschool? Great tips! I love the idea of a Latin notebook - my daughter would love to do that. Forgive the off topic nature, but read your blog post about series of history books while looking for ideas about an American history spine for high schoolers. I read A Patriot's History of the US with my son when he was in 11th grade and found it....ok. It was rather like drinking from a fire hose. SO. MUCH. information. I got to the end and felt like I didn't really remember much of anything I had read (even after spending time taking notes myself, and dialoguing with my student about the chapters). Now my daughter is a rising junior and I'm wondering if there is something similar but better out there. Any thoughts?